"When does a man write a good story? When he didn't think about writing it at all. It is created in his heart on its own. Suddenly he gets burned, and the burn aches and doesn't let up, he tries to write, and it 'works'..."
July 2012 marked one hundred years since the publication of S.Y. Agnon's first book, And the Crooked Shall Be Made Straight. The 25 year-old Agnon worked on the novella in the fall of 1911, while in Jaffa. He wrote the story without pause, working for four consecutive days, from four in the morning until four in the afternoon, feeding on bread and olives, not yielding from the act of writing. "When does a man write a good story? When he didn't think about writing it at all. It is created in his heart on its own. Suddenly he gets burned, and the burn aches and doesn't let up, he tries to write, and it 'works'...", Agnon said in an interview some time later. Agnon quickly showed the book to the Chief Rabbi of Jaffa and the Jewish settlements, Rabbi Avraham Yitzchak HaCohen Kook, who was established in the Neve-Tzedek neigborhood. Rabbi Kook was excited by the story and said of it "This is a truly Hebrew story, emanating from the direct sources without any barriers." Agnon, eager to hear opinions about his stories, especially the opinions of those whom he considered literature's greatest, decided to send the manuscript to his good friend Y.H. Brenner, who was living in Jerusalem at the time. Brenner was completely captivated by the work and was quick to recognize its literary qualities – years later the critic Baruch Kurzweil would write about "And The Crooked Shall Be Made Straight" that it is "a glorious work of youth that is wholly astounding in its maturity and epic perfection that rivals none." After reading the manuscript, Brenner assembled a goup of intellectuals in his small room and read them the story, sitting on a couch made of barrels of kerosene, reading line by line as if reading from the Torah. He wanted to publish it as a book. A conflict ensued between interested parties. The journalist and writer Rabbi Binyamin wanted Brenner to contact the writer A.L. Ben-Avigdor, editor of the publishing house "Tushia" in Warsaw, to publish the book. 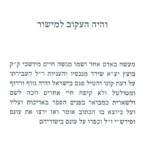 Yosef Aharonovitch wanted to publish the story in parts in the "HaPoel HaTzair". Everyone wanted a part in the publication of "And the Crooked Shall Be Made Straight". In the end, a settlement was reached. The story would first be published in the "HaPoel HaTzair" and later Brenner would publish it as a book. The story appeared in seven parts, between January and May 1912. The work of arranging the text for print was done by the publishing house of Aharon Itin in Jaffa. The printing plates used for the publication in "HaPoel HaTzair" were the same ones used by Brenner in the production of the book, and thus he was able to save on costs. R. Meir Anshin, also known as R. Meir Bratzlaver, a Breslev follower who worked alongside Brenner, arranged the book for print. As Gershom Scholem wrote, the combination of the two foretold of the way in which the work was to be regarded until this very day: "In Brenner's eyes this was the first Hebrew secular literary work, in which the tradition became a means of pure artistic expression... in the eyes of the typesetter, Meir Bratzlaver... the story was the true embodiment of the Hassidic Torah and its spirit." Brenner was in need of financial aid in order to publish "And the Crooked Shall Be Made Straight". Apart from what he saved by using the typsetter of "HaPoel HaTzair", he searched the literary community in Eretz-Israel hoping to find other sources of funding so that he could pay Aharon Itin, the publishing house's owner, the down payment. The brothers Shalom and Yeshayahu Shtreit, friends of Agnon and fellow Galicians, took to the cause. In addition, Rabbi Binyamin (Yehoshua Redler-Feldman's pen name), who Brenner suggested be a partner-investor in the book. R. Binyamin, another Galician close to Agnon, agreed to cover half of the expenses, and asked that the printed copies serve as security for his investment. During the production of Agnon's book debut, the young writer made his way to Jerusalem. Perhaps so that he could indulge in some of its lively characters, a combination of old and new, perhaps to visit Brenner and his friends, and perhaps to spend long days of non-stop reading at "Beit Ne'eman", the large library in the city (and one of the first incarnations of the National and Univeristy Library, later to become the National Library). In Jerusalem, Agnon quickly met up with Yosef Haim Brenner. In Brenner's narrow room, the two shared bread and olives and cheese and cocoa, Agnon's favorite drink. Over the meal, Agnon told Brenner that the printer Itin was demanding four or five more francs for the printing work. Brenner said nothing. He took some sort of object in his hand and invited Agnon for a walk. The two friends arrived at a store by Jaffa Gate, and there the purpose of the walk became clear to Agnon. Brenner handed over suspenders that he had bought at the store not long ago and asked for a refund. Agnon commented on this: "Now that four or five francs were needed for the the publication of a Hebrew book, he returned the suspenders to the shopkeeper and went back to using his old and tattered belt..."
"I ask you to find a man who will give of himself for the book of another." Below is a virtual exhibition highlighting the first edition of "And the Crooked Shall Be Made Straight", and later the Hebrew editions that were printed over the years, until 1994. Also exhibited are the publications of the novella in the "HaPoel HaTsair", a number of translated editions, correspondence between Agnon and Y.H. Brenner and others about the book, and finally the first critique by Lachover, from 1912, that greatly promoted the acceptance of the work amongst audiences and Hebrew cultural circles. תערוכה לכבוד 100 שנה ל"והיה העקוב למישור"
Opening text, first edition, 1912. Compilation of research articles about "And the Crooked Shall Be Made Straight"